Next week marks my fourth week on the job as the Foundation’s Director of Development. It’s been a whirlwind of learning about the Foundation’s past, it’s present, and hopes and plans for its future. The IAVM Foundation belongs to YOU, its members, and we work to offer you ways to advance and enhance your careers in the public assembly industry. We do this by offering scholarships and internships, education, certifications, and resources to our members. This is YOUR FOUNDATION. This is YOUR FUTURE. Foundation Fridays begin today. Each Friday all informational emails and social media going out from IAVM headquarters will pertain to the IAVM Foundation. The first Friday of each month is designated as “First Friday.” We want to keep you updated about what is happening here. 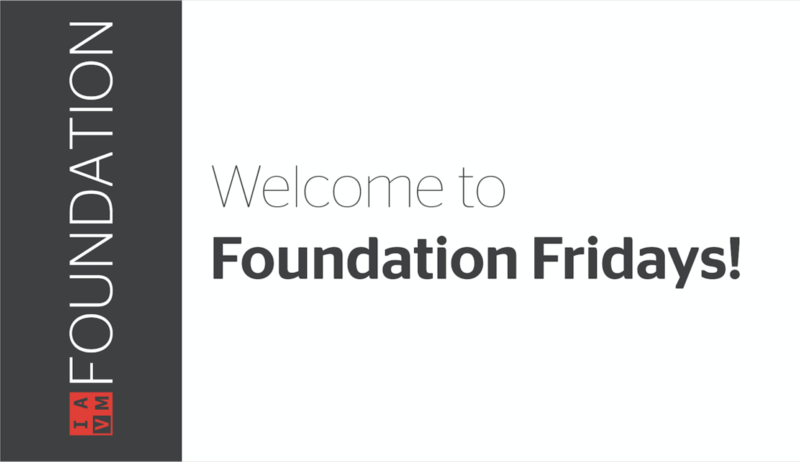 On First Friday, you will receive the Foundation monthly newsletter, which will include information about goings on at the Foundation, stories about how the Foundation has impacted a life or a career, a link to invest in YOUR FOUNDATION and YOUR FUTURE, and reminders about events, opportunities, and deadlines. Plans are underway for the Foundation activities at VenueConnect. The Foundation golf tournament takes place on Sunday, July 22nd. Go to http://www.iavm.org/venueconnect/register to register for VenueConnect and to register for the golf tournament under Optional Events. There are also numerous golf tournament sponsorship opportunities available in the Marketplace or by contacting Christy Jacobs, Director of Sales at IAVM Headquarters at 972-538-1015. I’m excited to announce that the Silent Auction will be back at VenueConnect this year. Look for it on the Trade Show floor in the Foundation booth. We are presently looking for items to include in the auction. Please watch on Foundation Fridays for updated information on the Silent Auction. The VenueConnect scholarships have been awarded to a deserving group of applicants. Committees made up of members from each sector and Foundation Board of Trustee members reviewed the applications and have chosen applicants from each sector to receive the Outstanding Leadership Scholarship, the Diversity Scholarship, the Young Professional Scholarship and the Scholarship for Industry Women. These are just the “tip of the iceberg” of what the Foundation is doing and has in store. I hope you will stay connected through Foundation Fridays to learn about the IAVM Foundation, what we do, who we serve, and the exciting developments as they unfold. I am looking forward to working for the IAVM Foundation and for YOU, the members of IAVM. Together, with your help, we can truly make an impact on the future of the IAVM and the professional lives of its members. Kathryn Eades is the Director of Development for the IAVM Foundation. She can be reached at kathryn.eades@iavm.org.